Fraud costs organisations worldwide an estimated 5 percent of their annual revenues, according to a study conducted by the Association of Certified Fraud Examiners (ACFE). 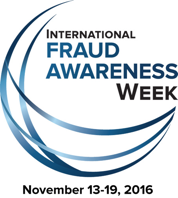 The seriousness of the global fraud problem is why Kalamazoo Direct announced that it will be participating in International Fraud Awareness Week, Nov. 13-19, 2016, as a supporter to promote anti-fraud awareness and education. The movement, known commonly as Fraud Week, champions the need to proactively fight fraud and help safeguard business and investments from the growing fraud problem. Kalamazoo Direct joins hundreds of organisations who have partnered with the ACFE, the world’s largest anti-fraud organisation and premier provider of anti-fraud training and education, for the yearly Fraud Week campaign. During Fraud Week, Kalamazoo Direct will engage in communicating with customers about fraud awareness, as well as promoting the Fraud Week campaign and steps organisations can take to help protect them from risk. It will also promote this to the wider community via the website, blogs and social media. ACFE President and CEO James D. Ratley, CFE, said that the support of organisations around the world helps make Fraud Week an effective tool in raising anti-fraud awareness. More information about increasing awareness and reducing the risk of fraud during International Fraud Awareness Week can be found at FraudWeek.com. Based in Austin, Texas, the ACFE is the world’s largest anti-fraud organisation and premier provider of anti-fraud training and education. Together with more than 75,000 members, the ACFE is reducing business fraud worldwide and inspiring public confidence in the integrity and objectivity within the profession. For more information, visit ACFE.com.